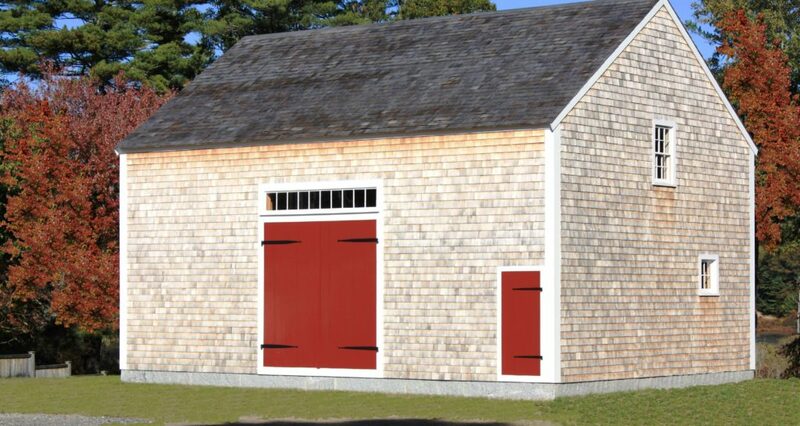 Barns are an intrinsic part of classic New England architecture and although they come in many forms, the majority of the ones that survived the colonial era into today were likely some form of timber frame construction. 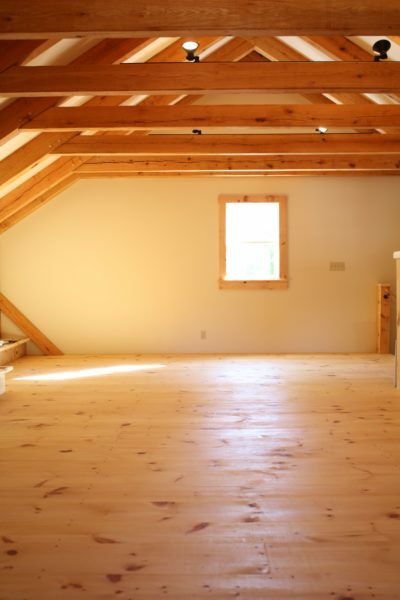 It’s estimated that timber frame construction has been utilized worldwide since approximately 200 B.C. and there’s no question about why it is still being used today. 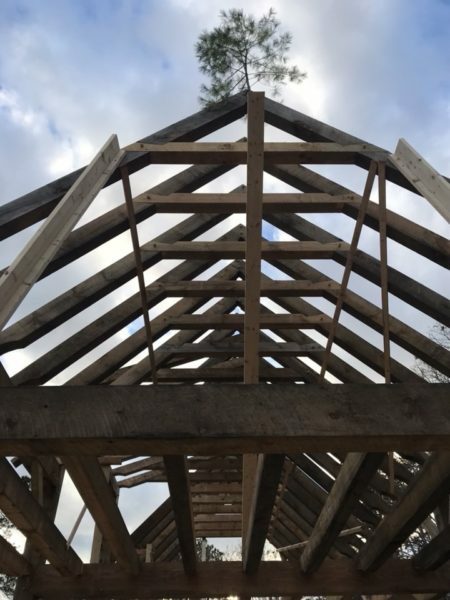 The method uses large scale beams that are shaped and connected with interlocking joinery & wooden pegs creating an immense amount of strength and durability while still allowing for a measure of flexibility. 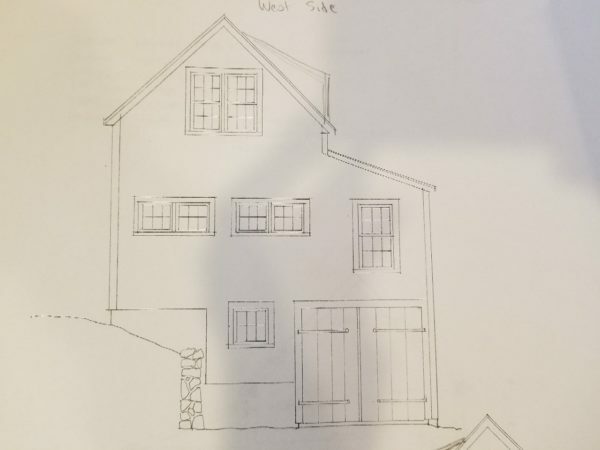 The result is a structure that can withstand whatever the New England weather patterns can dish out and when properly maintained, can last for generations. The process of erecting these long lasting structures has a history of its own as well as many long standing traditions that go along with it. 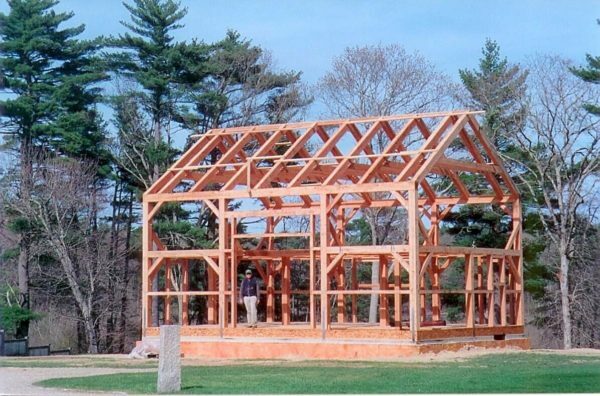 In Colonial times a good old fashioned barn raising was typically a community event. The old adage that “it takes a village” can also apply to constructing a massive structure in an era before crane’s and power tools; an entire community would literally have to come together to make it happen. 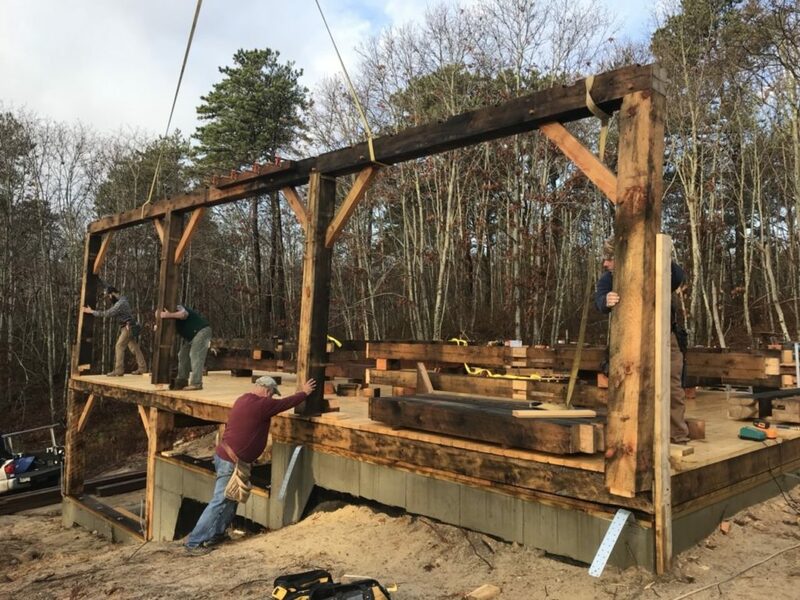 Fast forward to today and although we have the assistance of cranes and power tools, some of the social traditions that were adopted centuries ago are still running strong today. 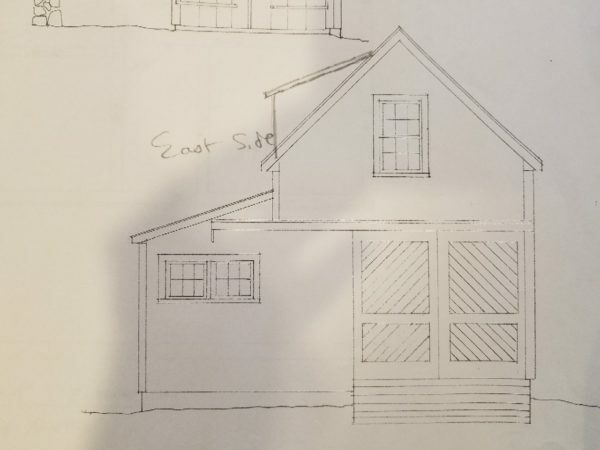 Our latest Custom Home Project in Plymouth Ma. is one that in both design and tradition is paying homage to times past. 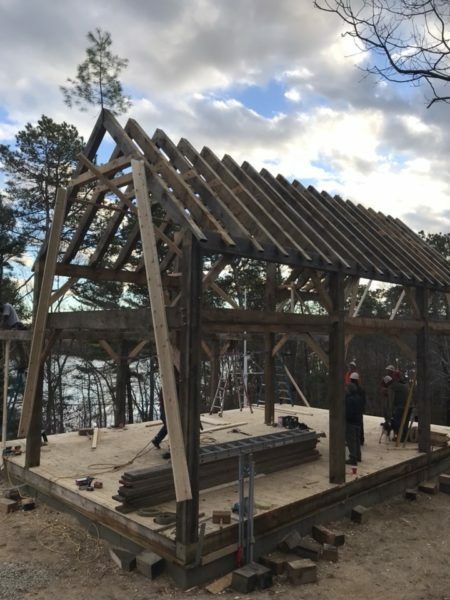 The main home was designed to look and feel like it had been built centuries ago with classic New England styling & finishes and high quality beam work that will be a lovely compliment to the newly raised timber frame barn on the property. 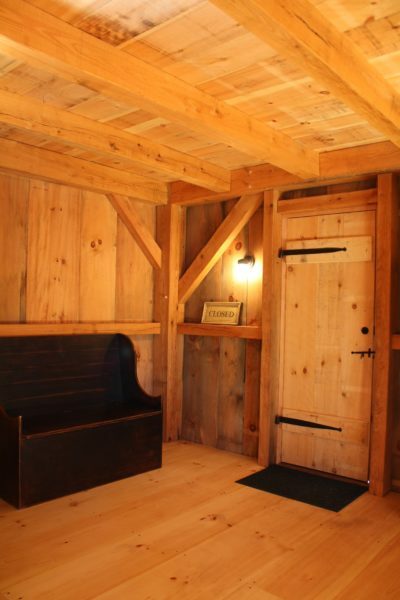 The Barn design calls for hundreds of wooden beams and pieces that were pre-engineered off site using modern technology & tools. The erecting of the barn however took on more of an old fashioned approach. The ritual of nailing a bough or small tree to the highest peak goes back hundreds of years and served two purposes. One was to pay homage to all the trees that went into the construction of the structure and to the many hands that built it. 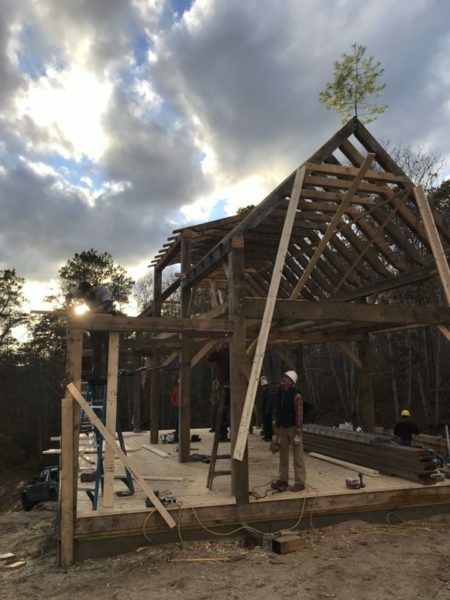 The other symbolizes the establishment of the Barn’s roots, which will nourish a long and prosperous life, one that will no doubt last for generations. This time of year though, one could also argue that the small tree is nod to Charlie Brown’s Christmas tree that gave importance to the simpler aspects of life, and the meaning behind them rather than their fancy facade. An old fashioned barn raising is for sure a reflection of simpler times past. The beauty is really in its simplicity. The warm wooden beams will provide solid structure and are just as beautiful and awe inspiring standing on their own as they will be after they’ve received their final facade. We have always had an immense amount of respect & admiration for classic architecture and building techniques and are proud to be a part of projects like this one that create quality lasting structures that will no doubt be enjoyed for generations to come!